Thank you Kim, for inviting me to share my favorite room in my house. Even though I spent 6 months renovating my house and changing every single room, it’s a little hard to choose just one fave, but today I’m going to choose my kitchen. I love how my kitchen turned out! 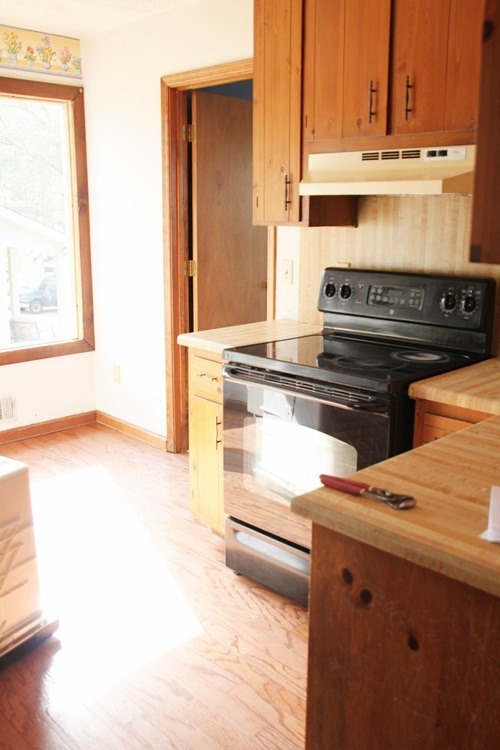 When I bought this house as a foreclosure in spring of 2012, the kitchen was horrendous. The whole house was pretty bad, but I saw potential in this place and am so happy that over a year has passed and I’m now living in my cute cottage. The kitchen has become a warm and inviting space for me and it’s so functional and great to cook in as well. It’s not a large kitchen, but I think I’ve made it as functional as it can be. 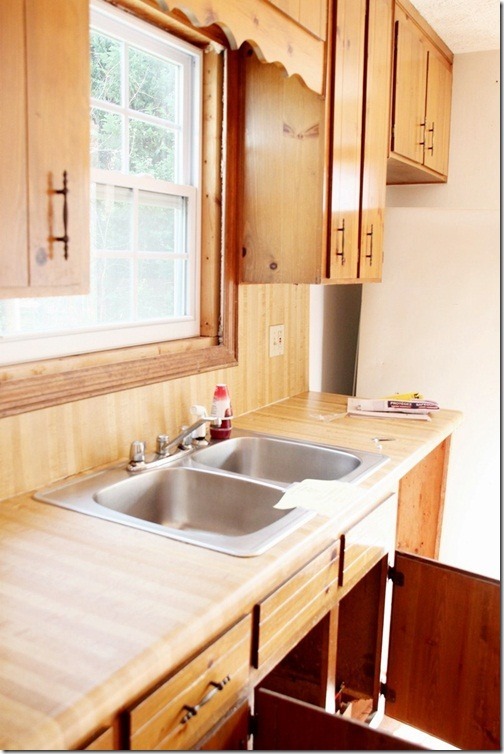 I have plenty of cabinet space and love the large pull-out drawers that were installed. I chose to install Ikea kitchen cabinets too and couldn’t be happier with my choice. Want to see the Before pics? You really have to see that to appreciate the afters. Here’s my kitchen in all her 1970’s glory. We decided to close up that door that you see above, which went out to the living room. 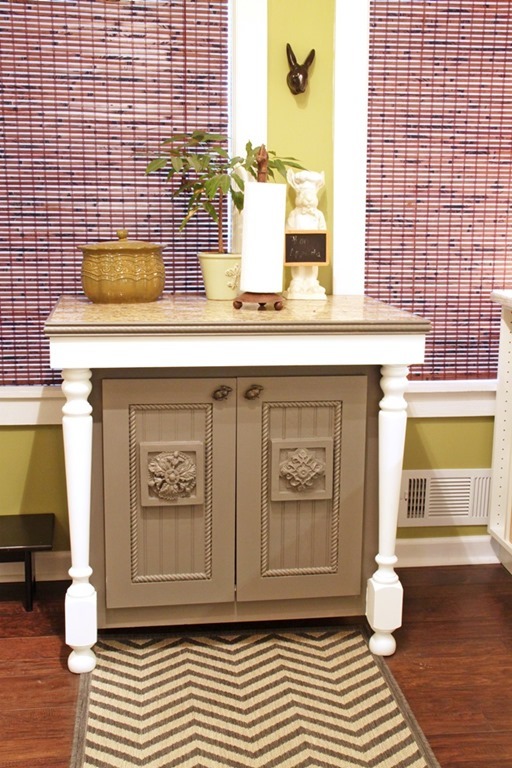 That gave me a huge wall to add a bank of cabinets that I totally love now. And this is the sink side. Pretty sad and pathetic, but we gutted it all and started from scratch and I got a beautiful Ikea kitchen of my dreams. Much better, don’t you think? 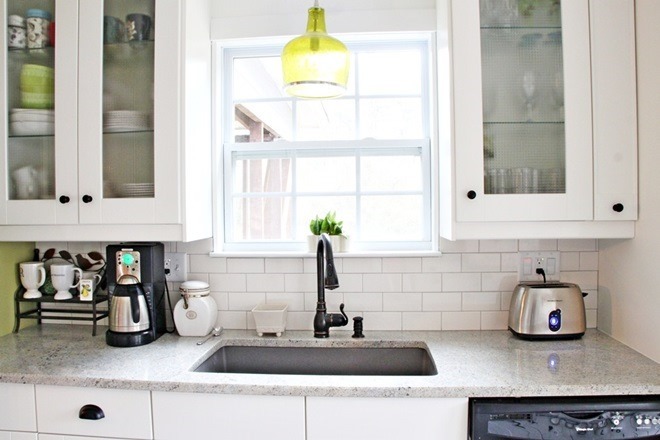 I was so happy to see this space come together into a pretty and functional kitchen for me to enjoy. These 4 pull out drawers really hold a lot of things and I don’t have to crawl inside base cabinets anymore to find something. 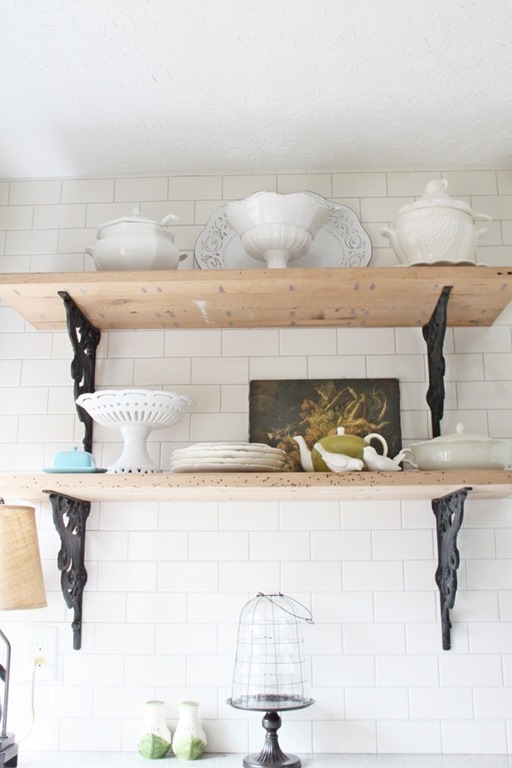 I added some pretty rustic reclaimed shelves which is a gorgeous focal point to my kitchen too and love them to pieces. A granite sink and oil rubbed bronze faucet complete the sink side. I also opted for cream subway tile and gray grout. I love my kitchen so much! The island I brought from my old house and it was a handmade piece that luckily I had room for. I did repaint it to better match my gray in the kitchen. 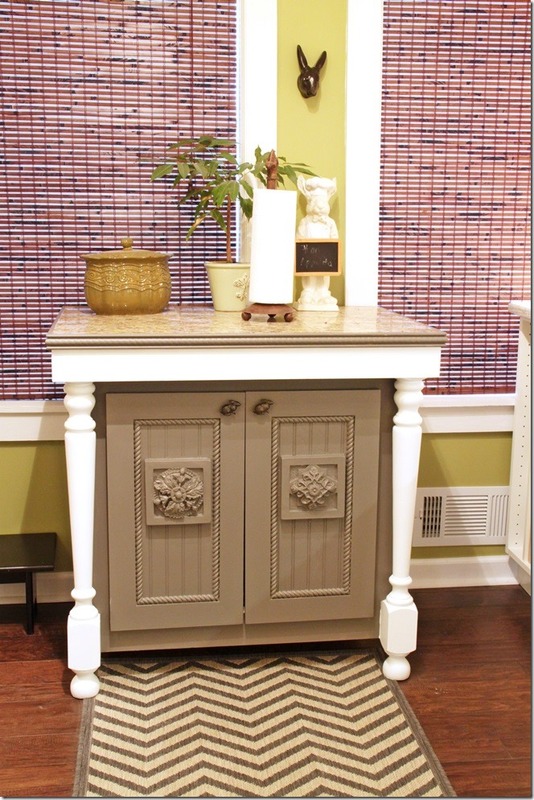 The chevron rug is from Ballard Designs. I’ve been in my house for a year now and am so content and happy with it. It’s been so much fun to make it my own and to really enjoy living here every day. The kitchen is just a warm place to hang out and cook and I really do enjoy it so much. Thanks again, Kim, for letting me share my favorite room in my house. 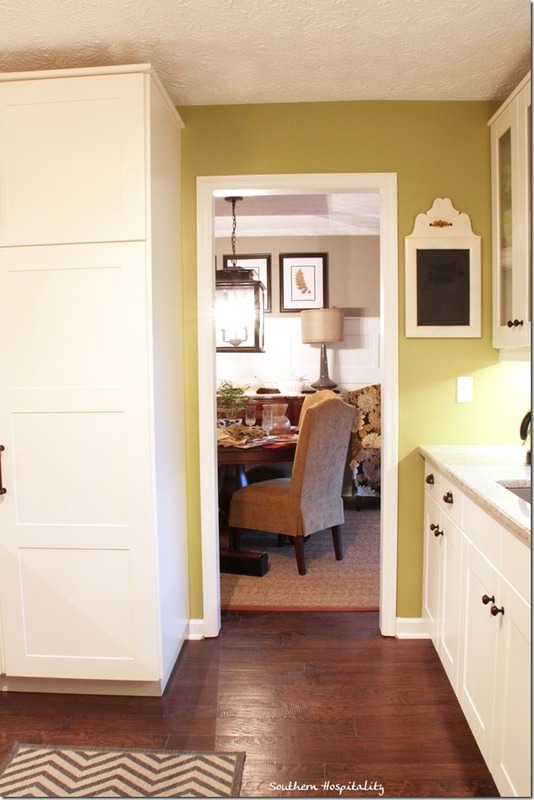 I’ve got lots of fun room transformations in this house and the kitchen was a big one for me. Thank you, Rhoda for sharing your beautiful kitchen here today. I am so glad that I was able to see it in person, at your open house. Okay, y'all unless you have been living under a rock you are most likely familiar with Southern Hospitality, but if you are one of a mere few who this blog is new to then go on over and say hi to Rhoda and enjoy more of her cute home. Kim, I love Rhoda's kitchen! I can see why it has become her favorite room. I love the colors and the shelving on the subway tile wall is just amazing! Rhoda is just the sweetest gal! I'm thrilled that she has a new home and love her kitchen too! Oh, I cannot imagine how Rhoda was able to pick her favorite room as every room in her home is gorgeous!….Had the great pleasure of seeing it in person and truly a phenomenal job that she and her dad did on the renovation of her new home…I cannot specify which detail I love the most in her kitchen, as I love them all!…Great feature today Kim!! Your first paragraph could have been written by me (except the feature part)! ;) We moved into fixer home, July of this year and are re-doing the whole thing. Your post reignited the excitement. My kitchen still isn't complete but it's getting there. Love what you did! Your home looks fantastic! 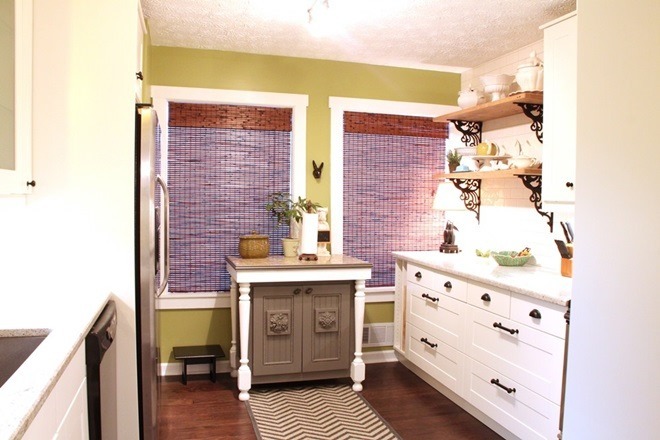 Kim, I never tire of seeing Rhoda's amazing transformation of that kitchen! 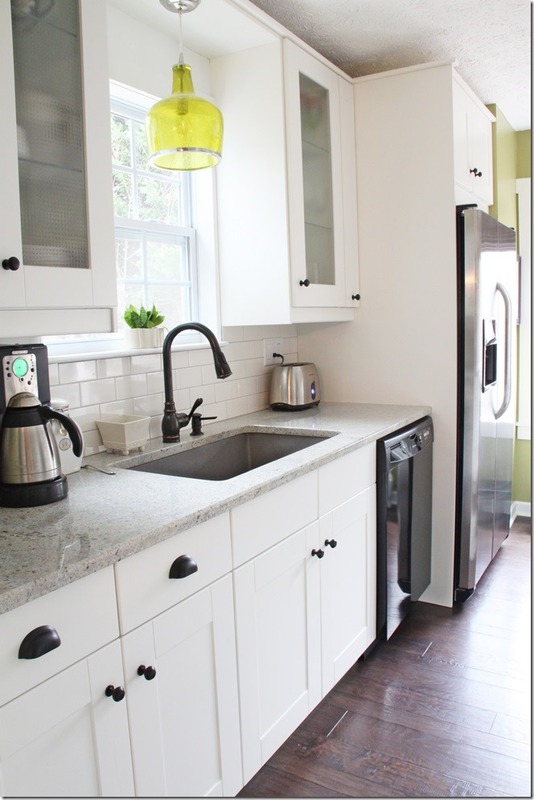 It was so fun following along each week as she and her dad renovated her home. Those shelves really give that kitchen personality! I LOVE Rhoda's beautiful kitchen...love her whole home!! Great feature Kim! 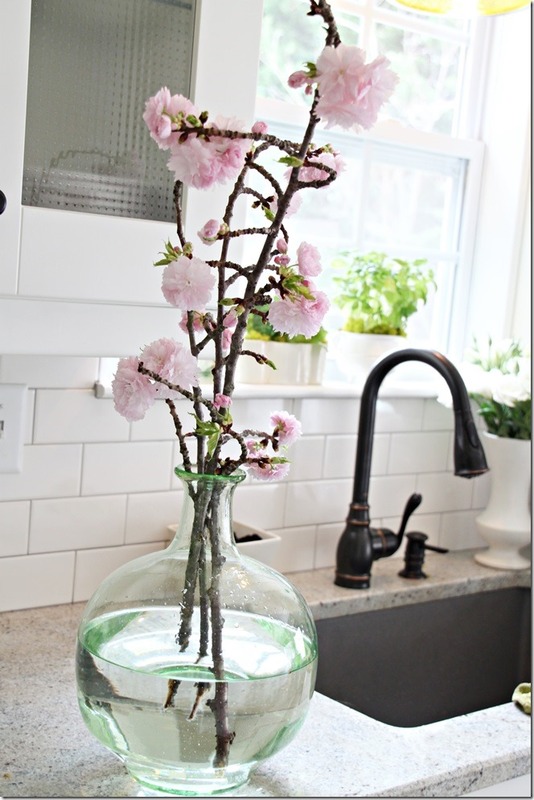 Thank you Kim, for featuring my kitchen today! So happy to be here and it's always fun to share a fave room. Have a great weekend! When I first started reading this post I thought, 'Wow, this sounds exactly like Southern Hospitality's kitchen' ....and of course it was her kitchen! Her kitchen is so cute and I love all her little bunnies. So fun to see two lovely ladies of the south together! "Watching Rhoda's kitchen (whole house!) transformed by the love and labor of her parents alongside her was a story for the senses & the heart! You did a fabulous job!!!!! Ikea rocks on so many levels!!!!! Rhoda's home is truly lovely!! I love the beautiful kitchen she created...and so affordable as well! Loved seeing Rhoda's kitchen...some how I'd missed it on her blog. It is so pretty! Love the open shelves the most. Well chosen feature, Kim - Rhoda has done her home well, indeed. 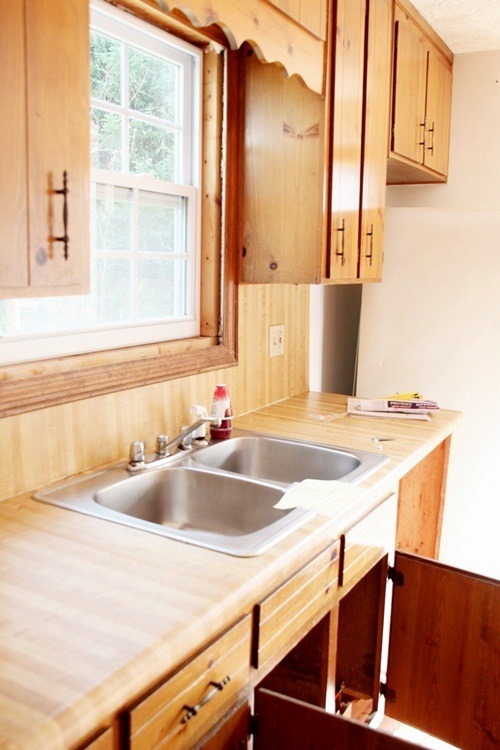 Great reno job. Well done Rhoda....and very well done Kim introducing us to Rhoda's kitchen. It is just beautiful. Lots of work but what a makeover.. Blessings! Please let Rhoda know I love her kitchen. The large pull out drawers? Brilliant and exactly what my husband and I need. Thanks for sharing and for the awesome idea! Rhoda did such a great job...the subway tiles are such a fresh update. What a gorgeous re-do! Love this kitchen, thanks for sharing.... We have subway tile here too, love the look it adds to the room. Hi Kimmie! Oh, I just love Rhoda's kitchen and all she's done to it. Her entire house has turned out so pretty. Rhoda, no wonder you love your kitchen! It's beautifully remodeled and now is so fresh and bright and upscale. Lots of warmth too! How amazing that you have only been in your home for a year and yet you have done so so much! Thanks for sharing your wonderful kitchen with us! Kim... you know this is my favorite series! Wonderful choice!!!! Beautiful kitchen! 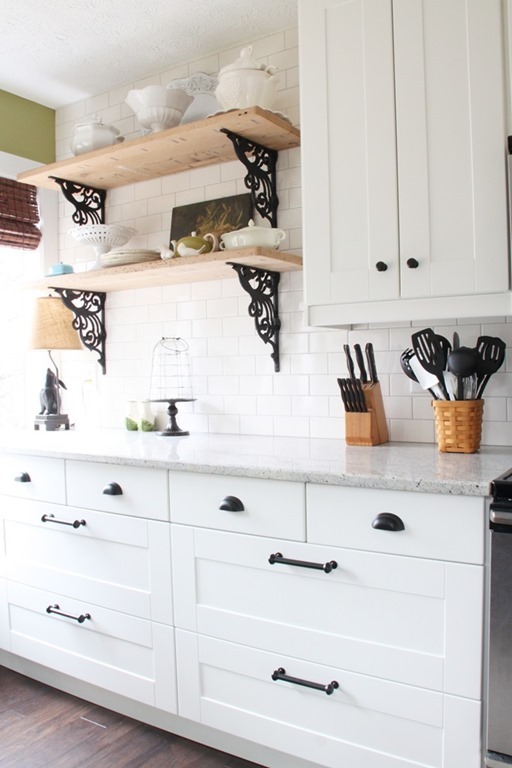 I just love white cabinets. The deep drawers are such a good idea, I hate crawling around in bottom cupboards. Rhoda what a beautiful transformation of your kitchen. It is an amazing space. Kim thanks for featuring Rhoda she was a great choice. Beautiful "My favorite room". I see why Rhoda picked her kitchen, it is beautiful and always the HEART of a home. Rhoda, you did such a wonderful job remodeling this (amd all of the rooms)!!! It has been fun to go on this journey and see how MUCH you have done!!! Great feauture, Kim! Love love love this kitchen! Sending my friend this link, since she is currently remodeling. I think there are lots of ideas for her here! Rhonda's kitchen is a work of art! She did a great job….can hardly believe it is the same kitchen! What a gorgeous kitchen! So bright and cheerful. I just posted about kitchens on my blog today, actually! Too funny!!! I love the idea of this post... because decorating is all about loving the final product and it's so evident that Kim really loves her final product here. Thanks for sharing!!!! Thanks, Cindy, but this is not my kitchen. It is a guest blogger's kitchen in a series I do on my blog.